Are you thinking of tackling some renovation projects in your home? If so, it’s important to consider return on investment. When you choose projects that will add the most value to your home, you can recoup much or all of your cost at resale. Home improvements vary greatly in cost and in the value they add to a home. Different geographic areas give different returns, and trends come and go each year. For 2016, upscale renovations, energy efficient improvements, and improvements in a home’s curb appeal are seeing the highest returns. Fiberglass attic insulation is seeing the highest return in most markets with an average 116% return. Other energy efficient renovations with a high return include steel or fiberglass entry door replacements and to a lesser degree, window replacements. Most of these renovations are also more affordable. First impressions are important, and homes that have good curb appeal make positive first impressions on both potential buyers and on neighbors who see the home every day. Adding manufactured stone veneer is showing a 100% return in many markets, and replacing siding, the roof, and the garage door are also showing high returns. Adding a deck has a lower return but is still a fairly good investment. Because existing home prices rose significantly in 2015 and 2016, upscale renovations are generating higher returns than in previous years. Topping the list is a back-up power generator. Other upscale renovations with good returns include a grand entrance, upscale major kitchen renovation, and a master suite addition. Some curb appeal renovations with high returns are also upscale, including an upscale garage door replacement and upscale wood window replacement. 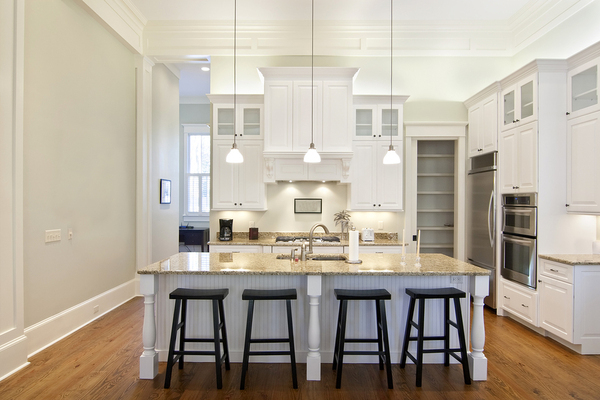 An upscale kitchen renovation remains high on the list of profitable home renovations. Should You Choose Renovations Only For the Return? Your home is probably one of your biggest investments, but you can balance the return on your renovations with improvements in function so that you get the most out of your renovation on a daily basis. It’s important to consider the return, especially when it comes to financing your project. Banks sometimes consider the intended renovation when deciding to give a home equity loan — if it will provide sufficient equity to cover the loan amount. Renovations can be costly, but you can save money by doing some of the work yourself. It doesn’t take a great deal of skill to do demolition or to paint after the structural work is completed. If you have experience with DIY projects, you may even be able to replace a door or windows. If you aren’t confident in your renovating abilities or your project is too complex, hiring a professional is your best option. Ready to get started? Apply for a loan with Northpointe Bank to fund your renovation and fall in love with your home again.